Flow cytometric analysis of HeLa cells (blue) and KARPAS-299 cells (green) using TNFRSF8/CD30 (E7E4D) XP® Rabbit mAb (Alexa Fluor® 594 Conjugate) (solid lines) or concentration-matched Rabbit (DA1E) mAb IgG XP® Isotype Control (Alexa Fluor® 594 Conjugate) #8760 (dashed lines). KARPAS cell line source: Dr. Abraham Karpas at the University of Cambridge. TNFRSF8/CD30 (E7E4D) XP® Rabbit mAb (Alexa Fluor® 594 Conjugate) recognizes endogenous levels of total TNFRSF8/CD30 protein. 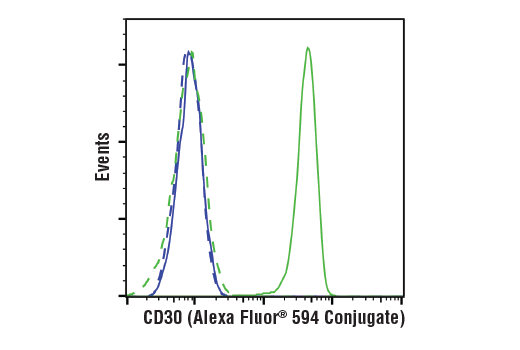 This Cell Signaling Technology antibody is conjugated to Alexa Fluor® 594 fluorescent dye and tested in-house for direct flow cytometric analysis in human cells. This antibody is expected to exhibit the same species cross-reactivity as the unconjugated TNFRSF8/CD30 (E7E4D) XP® Rabbit mAb #25114.